Plantskydd’s effectiveness as an animal browse deterrent has been confirmed in operational conditions by major North American forestry companies since 1993, on hundreds of millions of conifer and deciduous trees of various species. 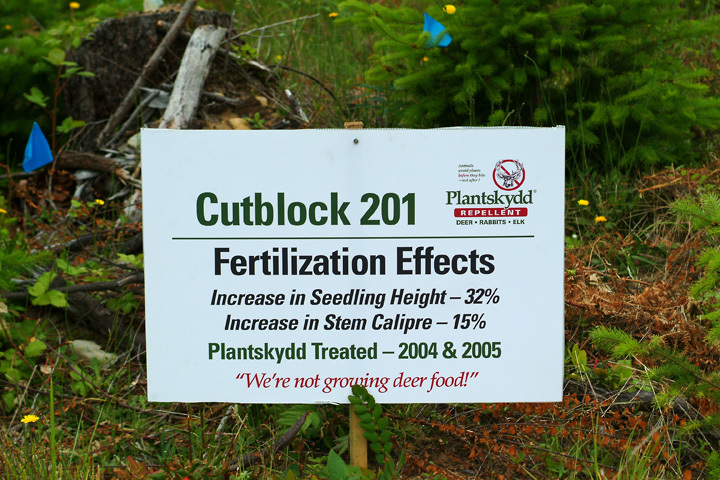 It’s long-term effectiveness—4 to 6 months over winter—is attributed to Plantskydd’s tenacity in sticking to plants—even under severe snow / rainfall conditions. 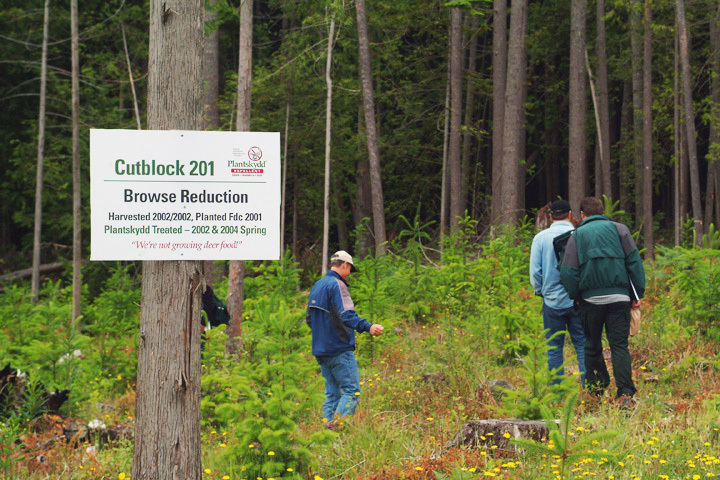 The Forest Industry has conducted extensive field trials. To obtain best results, call 1-800-252-6051 for more information. Plantskydd works by emitting an odor that animals associate with predator activity—repelling the animal before it nibbles on plants. The odour is not unpleasant to the applicator. Once animals are attracted to an area and begin feeding, it is more difficult to discourage them from returning. Plantskydd stimulates a fear-based response which will have them looking for somewhere else to dine. Which repellents actually work ? 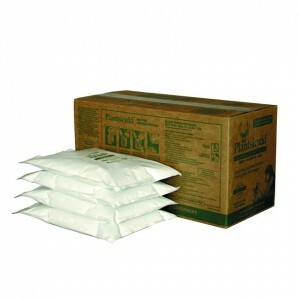 As an added benefit, Plantskydd acts as a foliar feed fertilizer (12N) for many types of plants. Plantskydd’s active ingredient, dried blood, has long been recognized as an organic fertilizer. Studies performed by Pennsylvania State University’s Department of Horticulture showed that the use of Plantskydd on a variety of flowering plants resulted in a fertilizing effect. Plantskydd® was first developed in Sweden in 1991 in response to commercial forest plantations being decimated by deer, moose and rabbits. Their forest industry needed an animal repellent that could: last through severe weather and meet Sweden’s strict environmental laws. 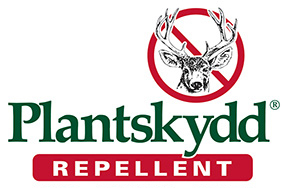 Plantskydd’s effectiveness as a long lasting animal browse repellent was substantiated in Field Trials 1991-1994 and the results published in the Scandinavian Journal of Forest Research—J. Berquist & G. Olander, Swedish University of Agricultural Sciences—ASA Forest Research Station, 1996. 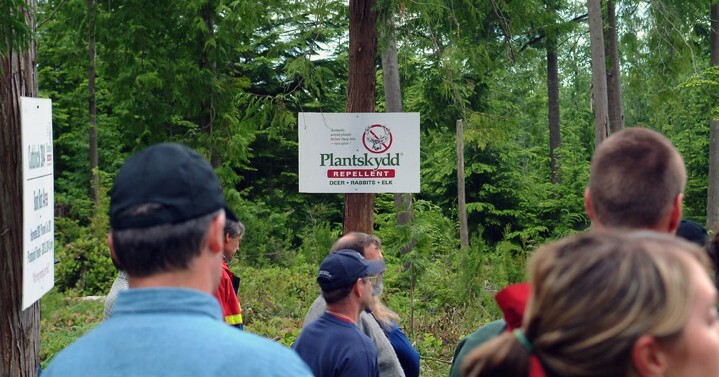 In Canada and the United States, Plantskydd’s effectiveness as an animal browse deterrent has been confirmed since 1994 in Operational Level Field Trials undertaken by large forest industry cooperators on millions of conifer and deciduous trees of various species. Plantskydd is now considered the most cost-effective and environmentally safe animal browse deterrent available. It is used as an animal browse deterrent by most leading forest companies, nurseries, private woodlot owners, and landscapers, as well as provincial, state and federal conservation agencies.